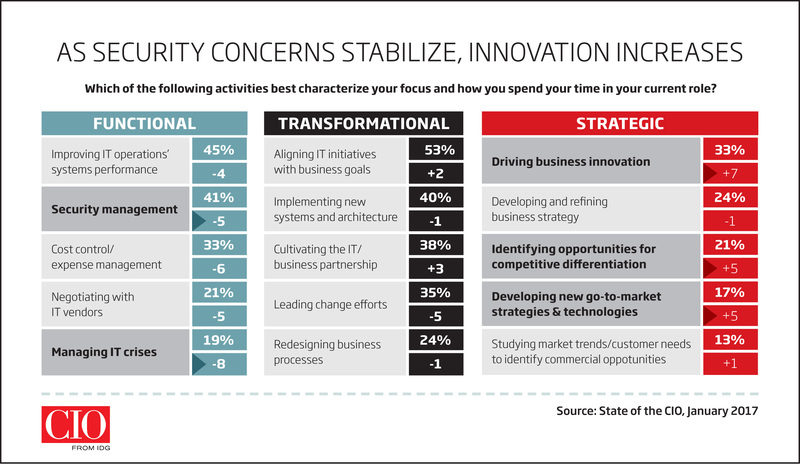 FRAMINGHAM, MA--(Marketwired - January 23, 2017) - CIO -- the executive-level IT media brand providing insight into business technology leadership -- reveals insights into the business goals and strategies that senior tech leaders are undertaking for the upcoming year in the 2017 State of the CIO survey (click to tweet). The results show that while CIOs may still need to maintain a dual role balancing operational needs with business innovation, they are finally able to spend more time on strategic responsibilities -- a shift that makes the role even more important to the overall business in a time where technology is central to success. With high profile security breaches continuing to impact organizations and taking over media headlines, security strategy is becoming synonymous with IT strategy -- 51% of heads of IT say the two are tightly integrated this year while just 37% said the same in 2016. As security becomes entwined in the IT master plan, CIOs are able to find more room for higher value, innovation activities such as driving business innovation (up seven percentage points to 33%), identifying opportunities for competitive differentiation and developing new go-to-market strategies and technologies (both up five percentage points from last year). "Executives have learned from past experiences and have prioritized cybersecurity as key to the business," said Adam Dennison, SVP/Publisher of CIO. "Now that those concerns have stabilized, CIOs are able to spend more time strategically enabling the business through technology implementations in areas such as data analytics, cloud, etc." However, with a heightened focus on innovative technologies also comes some difficulties for CIOs, especially in terms of finding the right talent in order to implement these technologies. Sixty percent of respondents to the 2017 State of the CIO survey said they were grappling with skills shortages (compared to 49% last year), and data science/BI and analytics skillsets has the biggest gap (38%). As technology leaders move closer to the business side of the house, different line of business (LOB) leaders see CIOs as strategic advisors (41%) or consultants (21%) identifying business needs and recommending solutions. This is especially evident when it comes to making purchases for the marketing technology stack, as nearly half of LOB respondents say both IT and marketing collaborate in key areas such as determining the business need (52%), meeting with/evaluating potential vendors (48%) and making final vendor selection (47%). To dive deeper into how to lead organizational change and innovation through digital and disruptive technologies, business and technology leaders are invited to attend the AGENDA17 conference taking place March 20-22, 2017 in Ponte Vedra Beach, Florida. To learn about sponsoring AGENDA17, contact Adam Dennison at adennison@idgenterprise.com. CIO's 2017 State of the CIO survey was conducted among the CIO brand's audience. The 16th annual survey was fielded online with the objective of understanding the current parameters of the CIO role and how it may be changing over time. To be considered qualified respondents must have identified themselves as the head of IT for their company or a division within it. Results are based on 646 qualified responses. The margin of error on a sample size of 646 is +/- 3.8 percentage points. CIO from IDG is the premier content and community resource for information technology executives and leaders thriving and prospering in this fast-paced era of IT transformation in the enterprise. The award-winning CIO portfolio -- CIO.com, CIO executive programs, CIO Strategic Marketing Services, CIO Forum on LinkedIn, CIO Executive Council and CIO primary research -- provides business technology leaders with analysis and insight on information technology trends and a keen understanding of IT's role in achieving business goals. Additionally, CIO provides opportunities for IT solution providers to reach this executive IT audience. The CIO Executive Council is a professional organization of CIOs created to serve as an unbiased and trusted peer advisory group. CIO is published by IDG Enterprise, a subsidiary of IDG. Company information is available at http://www.idgenterprise.com/. CIOs move focus to tech innovation.